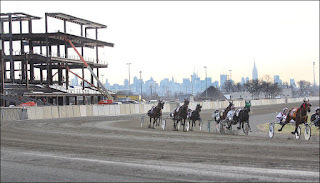 As the first dozen years of the new millennium come to a close, harness players look at the horizon of a another season, including a new era for the Meadowlands, which opens its next standardbred meet just a few days before the year ends. As well, we continue to update and supply more entries to our ultra-powerful horses-to watch list (H2W), continuing to provide TwinSpires players and blog readers proverbial “hot horses” based on our experienced spotters’ evaluations of recent races at various raceways. The Meadowlands resumes live racing on Dec. 28 and 29 and will have a 2013 schedule from Jan. 3 to Aug. 3 plus Nov. 23 to Dec. 28 for a total of 82 dates. ABC Racing categorizes horses into A, B and C rankings, replacing detailed conditions determined by money earnings. The system permits the racing secretary to create races in which the entrants are most competitive and equal in ability. Horses no longer stable at the facility and racing will not take place as many times a week as it did when the ABC system worked so well in New York. Koch has to deal with horsemen that can ship to other tracks and return, raising a question as to the class their horses fit. Forty years ago if a trainer didn’t like how his horse was classified, he could place the horse in a claimer. So the system takes on a new form that is yet to be clear in its affect on the competition. All of us in the sport will be monitoring the progress or digression of class distinction as the meet ensues and we will be reporting about it all here. Meanwhile, the New Meadowlands offers H2W horses, as listed below. Opening night has a post time set for 7:15 p.m. A new bet makes its debut in the $25,000 Early Pick 4 (Races 3-6). The $15,000 Pick 5 (Races 1-5) and the $50,000 Late Pick 4 (Races 7-10) make their return to the wagering format. The H2W legend is as usual. Before the horses’ names is the track, followed on the next paragraph by a date it (or they) will be racing, with the race in which they are entered (R and race number). If a + is in front of a horse’s name, it means that horse is appearing on the list for the second and last time because it failed to win the first time it appeared. An “ae” means the horse is on the also-eligible list and needs a scratch to get into the race. It is up to you how to deal with more than one horse on the list that is entered in the same race. If a horse that has appeared on the list but was scratched or is not racing its second week consecutively, you will see a N/R after its name and will appear on a separate line from dated entries. And if a horse shows up at another track in its second week of being listed, it will display the plus sign as indicated above. Freehold has closed, as has Philly. The H2W list displays “live” horses that have shown strict potential in recent events, having been thwarted by traffic or going a trip that sends up a flair to notice fresh form. All of them need to be considered contenders in the races noted, getting two chances on the list Wagering on them is based on your own judgment of value, as well as how to do so (win, place, show or exotic). If you have any questions about the H2W list, send them to us through the TwinSpires blog channel. One reason individuals pick payday credits is speed. You can get money quickly when you require it. Notwithstanding, in cases that you can't pay the credit you got from them on your payday, they will charge intrigue that you should pay together with your advance on a given traverse of time. Applying for auto value credits are simple when you apply on the web. Ensure the loan specialist has a safe site since you will submit touchy individual data that could be abused for fraud. This is essentially considerably quicker than documenting an advance using a credit card banks that takes years. In addition, on the off chance that you locate an incredible organization, they won't not give your credit an intrigue when you will pay them back inside seven days.